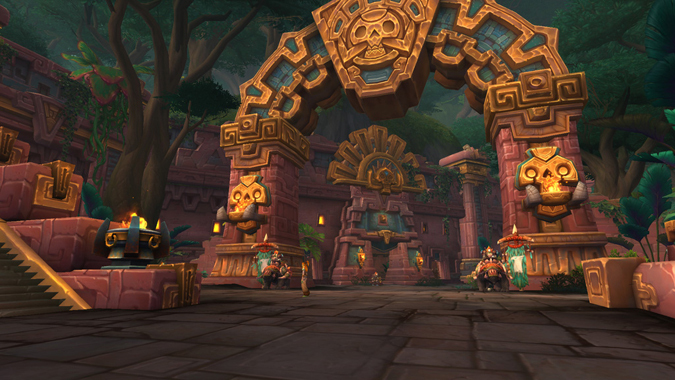 Patch 8.1 is long since live, but the Battle for Dazar’alor raid didn’t come with it. Blizzard gave us all a holiday break from raid progression, but we’re getting closer to the raid’s January release date. As usual, Normal and Heroic modes will go live first, followed by Mythic and then Raid Finder. And for all of you looking specifically for this information, Raid Finder will require ilevel 350 to queue, so get running Uldir and doing incursions if you aren’t there yet. This raid will have six bosses and will offer a different storyline for Alliance and Horde — but don’t worry, because you’ll be able to experience it from both sides (sometimes as your Horde or Alliance alter ego). Want more details? Blizzard has posted a complete raid preview to satisfy your curiousity. But I’m still curious as to how this two-faction raid will work out. Are fights like Grong completely different encounters, or are they the same but with different set dressing? And, as a proud Gnome, I’m anxiously awaiting news of Mekkatorque’s fate. (Though we’ve had some spoilers already.) The Jaina and Rastakhan fights are also bound to be interesting — you’ve probably already heard about Jaina’s iceblock games — and I am outright bouncing with excitement to find out what happens. We’ll see how long I manage to keep up with the bouncing considering launch is nearly seven weeks away. Along with Dazar’alor, PVP Season 2 and Mythic Keystone Dungeon Season 2 will both kick off on January 22. If you haven’t finished your goals for this tier of content, you still have time to wrap things up — though for anyone who’s hit their Uldir goals, this feels like a long dry season for raiding. Well, everyone can use a break now and then. And I do need time to level my Blood Elf so I can enjoy this raid from both factions. Alliance or Horde, I hope to see you in Dazar’alor in a few weeks.